By Puneet Devgun, D.O., Alison Chetlen, D.O. 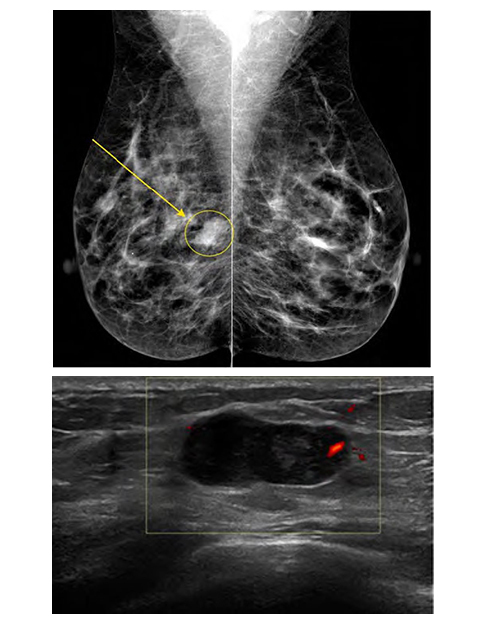 The arrow on the mammogram points to a new screening detected lobular mass. The corresponding ultrasound image demonstrates a solid, lobular, hypervascular, hypoechoic lobular mass with circumscribed margins, parallel orientation, and posterior acoustic enhancement. Given the imaging appearance, differential considerations for this mass include infiltrating ductal carcinoma, fibroadenoma, and metaplastic breast carcinoma. Metaplastic breast carcinoma is a rare malignancy, accounting for fewer than 5 % of breast carcinomas. It is characterized by coexisting ductal carcinoma with areas of matrix producing, spindle-cell, sarcomatous, or squamous differentiation. Metaplastic carcinoma in general displays more benign imaging features compared to invasive ductal carcinoma. On mammography, metaplastic carcinoma presents as a round or oval mass with circumscribed margins. On ultrasound, metaplastic carcinoma often demonstrates benign features such as an oval, round, or lobular shape with circumscribed margins, but interestingly demonstrates posterior acoustic enhancement. Core needle biopsy is recommended for any mammographic mass that does not fit all benign criteria by mammography or sonography. The differentiation between invasive ductal carcinoma and metaplastic carcinoma is important for both treatment planning and prognosis. Metaplastic tumors tend to be large at presentation, hormone receptor and HER2/neu-negative, and have a low incidence of regional lymph node involvement. Traditional chemotherapy and hormonal therapies for invasive ductal carcinoma are ineffective against metaplastic carcinoma, and it is often associated with a poorer survival rate. Devgun P, Chetlen A. At the Viewbox: Metaplastic Breast Carcinoma. J Am Osteopath Coll Radiol. 2014;3(1):27. Puneet Devgun, D.O., Alison Chetlen, D.O. Dr. Devgun and Dr. Chetlen work with the Department of Radiology, Penn State Milton S. Hershey Medical Center, Hershey, PA.